An innovative and shared oceanic air traffic control system with enhanced features has been implemented at NATS’ Control Centre in Prestwick, Scotland and NAV CANADA’s Control Centre in Gander, Newfoundland to assist controllers as they direct aircraft across the North Atlantic – the busiest oceanic airspace in the world. 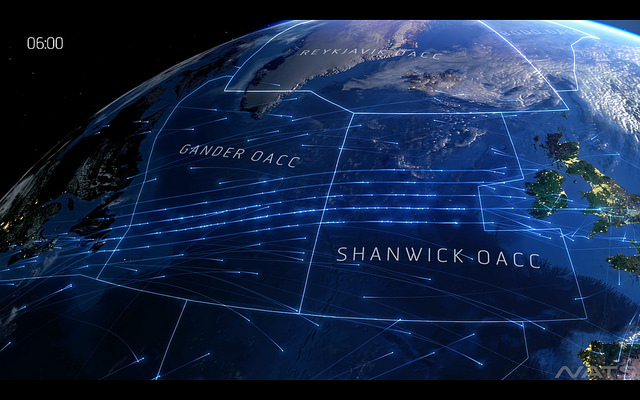 The technology, originally installed in Gander and operational in Prestwick since earlier this week, is known as the Gander Automated Air Traffic System (GAATS+) – the world’s most advanced oceanic air traffic system. GAATS+ is a result of a unique NAV CANADA and NATS joint development model that has been in place since 2003. This is when a team of technical and operational experts from Canada and the UK worked together to adapt an early version of NAV CANADA’s GAATS in order to meet the technical and operational requirements of the Prestwick Centre. This same successful “build-once, use-twice” approach has been used again recently to prepare and migrate the current GAATS+ system for use in the NATS Control Centre in Prestwick. Now, for the first time, controllers in Prestwick and Gander can exchange messages back and forth with advanced automation, allowing improved coordination between the centres. This functionality is in addition to other enhanced features of GAATS+ that will facilitate further improvements to the safety and efficiency of transatlantic air routes, and will help to position the two organisations for future initiatives such as SWIM (System Wide Information Management) to enable greater sharing and integration of ATM system information. Martin Rolfe, Managing Director, Operations, NATS, said: “The use of GAATS+ at the NATS Control Centre in Prestwick will greatly enhance the Oceanic operation and increase efficiencies for us as well as for our airline customers. This is a hugely important development not only for the immediate benefits it will deliver, but also for future technologies that the system will enable. It is a further step towards a more harmonised operational and technical approach between all of the countries that manage aircraft over the North Atlantic”. “Both our customers and our controllers will benefit from increased functionality and greater commonality at both Oceanic centres”, said John Crichton, President and CEO of NAV CANADA. “This includes the seamless integration of ground-based ADS-B surveillance features in GAATS+ which will serve as the basis for the satellite-based ADS-B services offered by Aireon in 2018”. The success of the original agreement between NATS and NAV CANADA and the implementation of GAATS+ across the North Atlantic has also provided a foundation to broaden the scope of collaboration. A new Program called COAST (Collaboration on Oceanic Airspace and System Tools) will be focusing on continued long-term collaboration opportunities for improved safety, service, value and environmental benefits for customers who fly the North Atlantic.